I am now officially Christa Marie Nolan! This whole month has been a whirlwind. I can't believe it is already almost September! At the beginning of the month I had to say goodbye to my old roomies Jenna and Kristina. 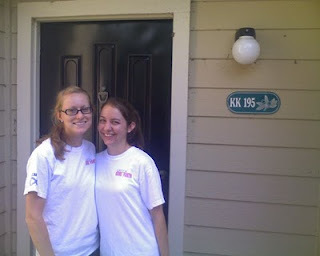 It really was an emotional time because I had lived in that same apartment with Kristina for 4 years. I was very fortunate to have three great roommates throughout the years. On the last day in the apartment, Eric, Kristina, and I were hurrying to get the rest of my stuff out and clean up. Kristina and I were ironically both wearing our CCH Gone Forth shirts. After mopping and making one final run through we locked the doors to our apartment forever. After we turned in our keys we stood in the parking lot trying to hold back tears. As soon as I got in my car I burst in to tears and cried for a while once I arrived at my new apartment. I will miss living with my roomies, but will never forget the memories we made in good ol' KK195.